You've tried so many foam rollers but you can't seem to get that gnarly knot out of your back. Fear not because we have you covered in today's article. We've tested out the most popular foam rollers and found a surprising winner both in terms of overall value and results. All foam rollers will be reviewed on based price, effectiveness, firmness, and overall value. I didn't always have a love affair with foam rolling, in fact there was a time when I thought it was downright gimmicky and pointless. You can tell I wasn't as smart as I am now. I got a subtle nudge in the right direction when I blew out my knee and couldn't walk for weeks. At that point I was willing to give my right leg to... well, be able to use my right leg. After a quick apology, me and the foam roller became inseparable friends. 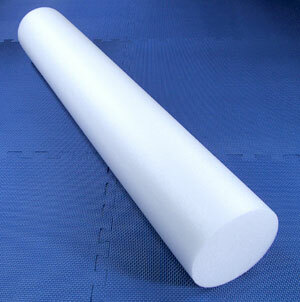 This is the ancient foam roller from which all modern foam rollers evolved (intelligently designed?) from. It works well enough for a complete beginner or someone who is carrying a lot of weight. The sad reality is it doesn't last long. 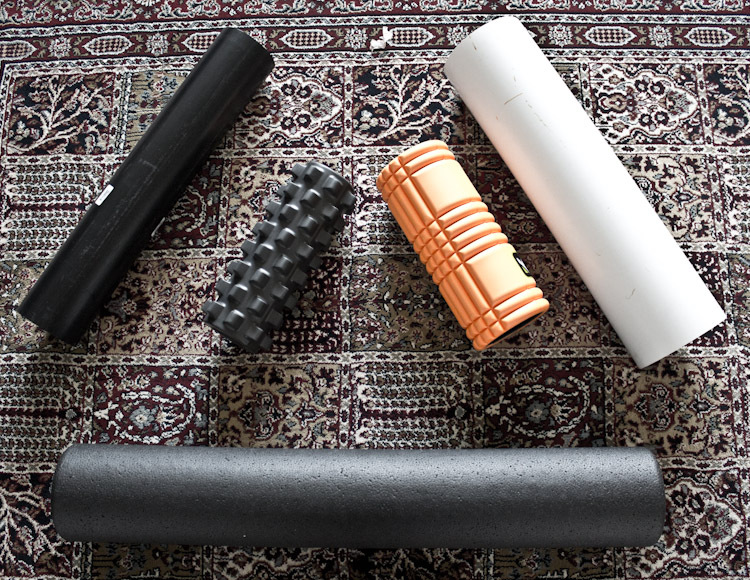 While at first it will feel like a torture devise from a medieval dungeon, as your tissue quality improves, and scar tissue dissolves, this foam roller will end up feeling more like a pillow. Since it's made from loose foam, this foam roller will break down quickly. Head to your local 24 hour or Bally's and to view one of these withered specimens (See foam roller picture below). It's too soft, too flimsy and has a short lifespan. Although relatively inexpensive, it's better to spend a bit more and get something that will last longer and work better. Keep reading for our recommendation. The most popular type of roller and for good reason. It's the same design as the basic foam roller except made from high density foam, which means it's harder and will last longer. The hardness makes it effective for almost everyone; it should be in everybody's toolkit. The Bruiser is right to the point, nothing fancy, no color mosiacs or gimmicky patterns. It's simple, effective and overall a great value. Everyone should have one of those! This is the one we use, make sure to get the round one unless you don't want it to actually roll - a client did this once and was really confused. 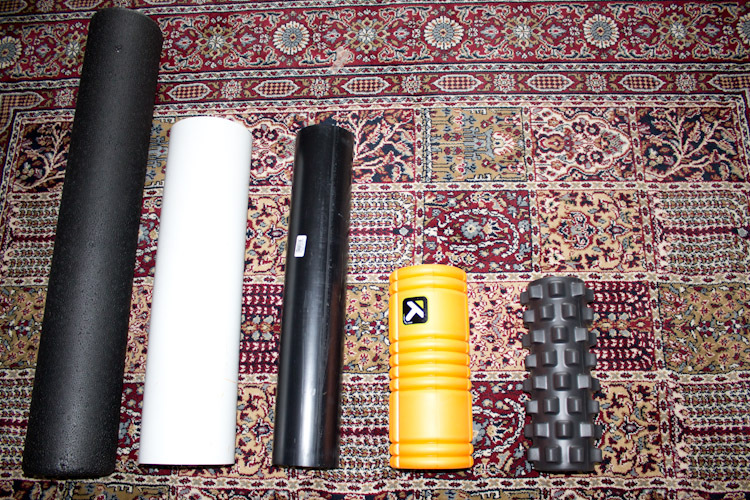 We received the RumbleRoller to give it a formal test and review whether it's a good foam roller for our clients. All the other rollers looked so plain and this one promised some deep tissue work. It definitely looked the part, and not to mention I ended up getting the black one - which is denser and harder than it's blue sibling. Visually it looks good but the moment you start rolling you immediately realize.. it doesn't really roll. OK it rolls, but since its surface is made out of spikes it just ends up poking you. A roller is supposed to be like a dough rolling pin: pushing fluid and evening out muscle tissue. In concept you can have spikes for more focused pressure but those unfortunately are too small to work and only end up jabbing you with poor aim as they quickly roll past. Add in the ridiculous price tag and the only time you should buy this is as a gag gift at your next bachelor party. I was intrigued when I first saw THE GRID. It seemed to be everything the high density roller was, only more. Built with a sturdy core, it promised firmness and reliability. The outer padding claimed variable pressure for working different areas. I even got it for free to try it out. Seemed like nothing could go wrong. I was really excited when it arrived and quickly jumped on it to get my myofascial release on. It's kinda small but I started rolling anyway; a couple of minutes later I started to realize that nothing was happening. 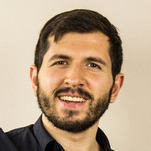 The padding that promised variable firmness actually delivered uniform mushiness. What's more, the hollow core actually caved in under the slightest pressure, transforming the "roller" into a flat tire. It all seemed like an episode of Punk'D except Ashton Kutcher was nowhere to be found. The GRID left me speechless - in a bad way. You are better off buying a PVC pipe - which is what THE GRID's core is made out of - and pocket the remaining $35. Our champions emerged: The PVC pipes! If the Bruiser was simple the PVC pipe is downright mentally challenged. It's not even a foam roller so why have it on the list? Because it works so damn well. Firmness: Do you even need to ask? You don't get much harder, cheaper or reliable than PVC pipes. Put down that lululemon coupon and head to your local hardware store and pick up one these badboys. The only drawback is that they are so hard that anyone with a lot of tight muscles and scar tissue should tread carefully. Yeah you can pull it off, but it's like getting your first driving lesson in a Lamborghini diablo. As for size: a bigger diameter pipe is going to be easier since your weight is spread over a larger surface, but it doesn't work well for smaller muscle groups. A smaller diameter pipe digs in more, but is really brutal if you're not used to foam rolling, so not for the faint of heart. Just like everything in life, simple is usually better. Sometimes we are tempted to try and spend our problems away, but often times you just end up in dummy-traps like THE GRID and the RUMBLE ROLLER. Stick to the basics, get a high density roller or PVC pipe and just start rolling. Make sure to read the How to Foam Roll guide if you haven't already (Sorry, clients only! 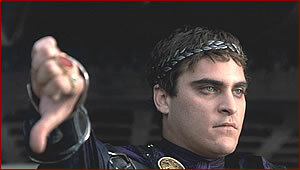 But we'll make a future post for our public readers). Hope you enjoyed this post and please share so your friends don't end up with one of these monstrosities - or on second thought don't since that would be pretty funny.